WHAT: A fun-filled, family-friendly race on a tree-lighted course along the water on beautiful Flagler Drive. 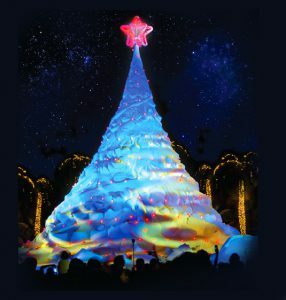 After the race, enjoy the tropical-themed holiday festivities on the West Palm Beach Waterfront including Sandi, the world’s only 600-ton holiday tree sculpted from sand, music and light shows that dazzle featuring over 5,000 animated lights. RACE BENEFICIARY: This event helps to raise money for the West Palm Beach Police Foundation. This December the City of West Palm Beach is rolling out the red carpet for one of the BIGGEST celebrities ever during Holiday in Paradise. Taking center stage on the West Palm Beach Waterfront is Sandi, the World’s ONLY 600-ton sand tree. Truly the star of the show, Sandi is a staggering 35 feet tall and dazzles crowds with nightly music and light shows starting at the December 1 Clematis by Night Tree Lighting, through New Year’s Day. Sandi’s phenomenal supporting cast includes four additional, award-worthy sand sculptures and tons of FREE family fun including a backstage peek in Sandi’s Dressing Room and the whimsical SnowieVille, where kids can build a tropical snowman. The popular Glow FORE It 9-hole Mini Golf returns to the Waterfront along with over a dozen of your favorite City events.